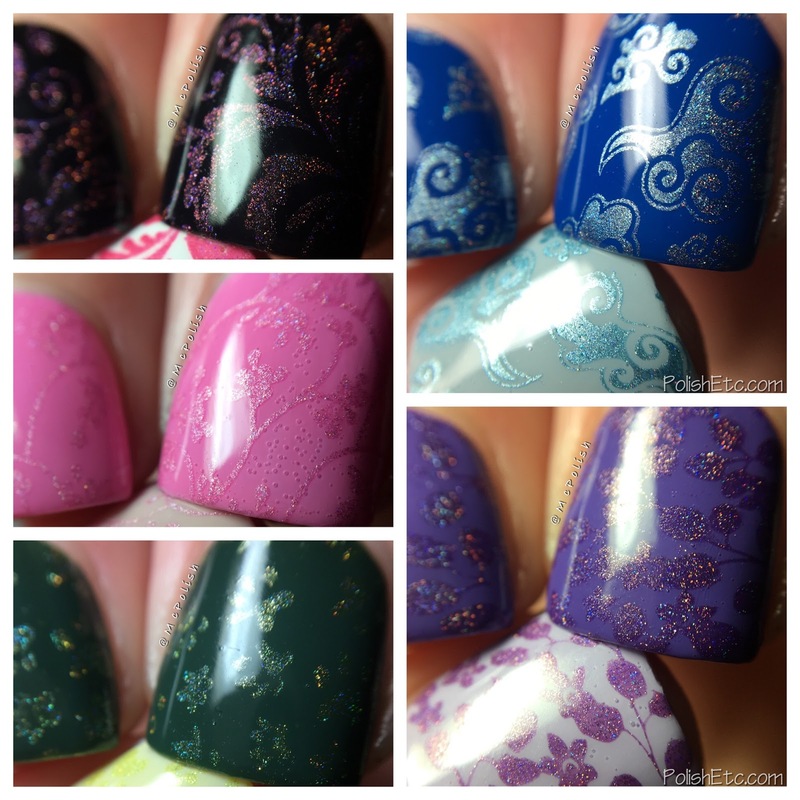 Celestial Cosmetics and Color4Nails Stamping polishes - Polish Etc. 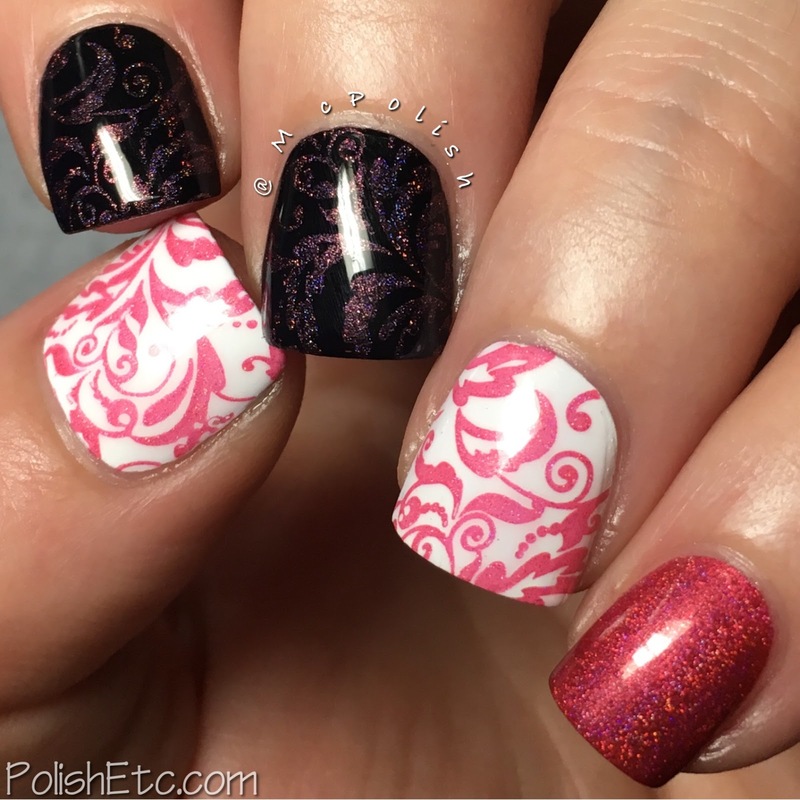 Celestial Cosmetics has teamed up with Color4Nails to create a line of stamping polishes. They have already released a set of creme shades and now have come out with a few holographic options. I have the 5 new holographic shades to share with you today. 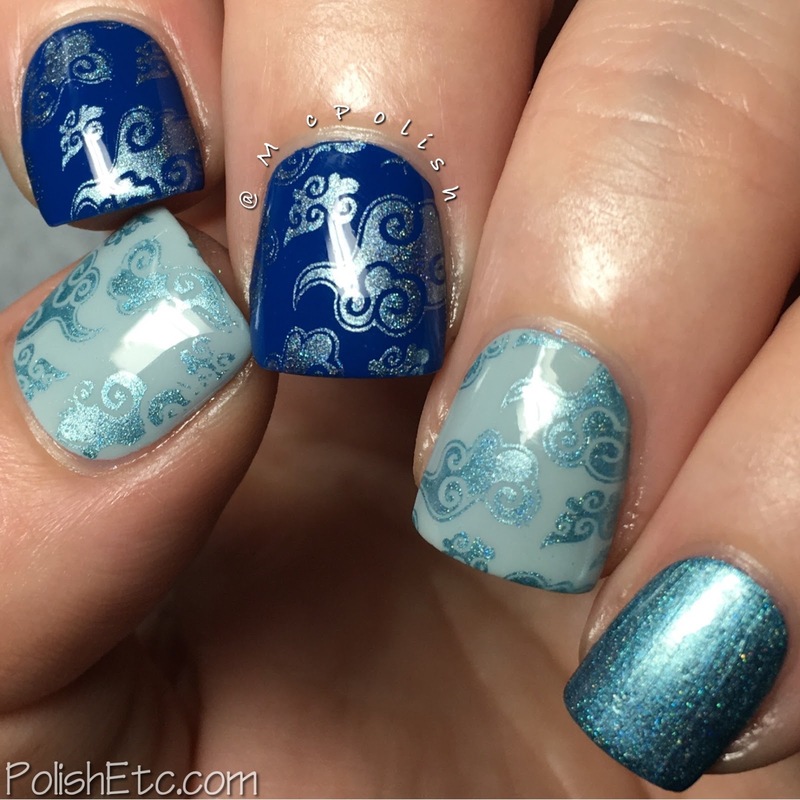 I will be showing you each color stamped over a light and dark base as well at the stamping polish used on it's own. Overall, there polishes stamped well but you have to be selective on what color based to use them over. They all showed up nicely over light bases but were iffy over the darker bases. These new holo shades released on Friday, so let's get into the colors! Azure - A icy blue metallic with holographic effect. This is the best of the bunch! And the reason is because of the slightly metallic base. This allows it to be nice and opaque over both dark and light colors. It picks up great and leaves nice crisp, even lines. 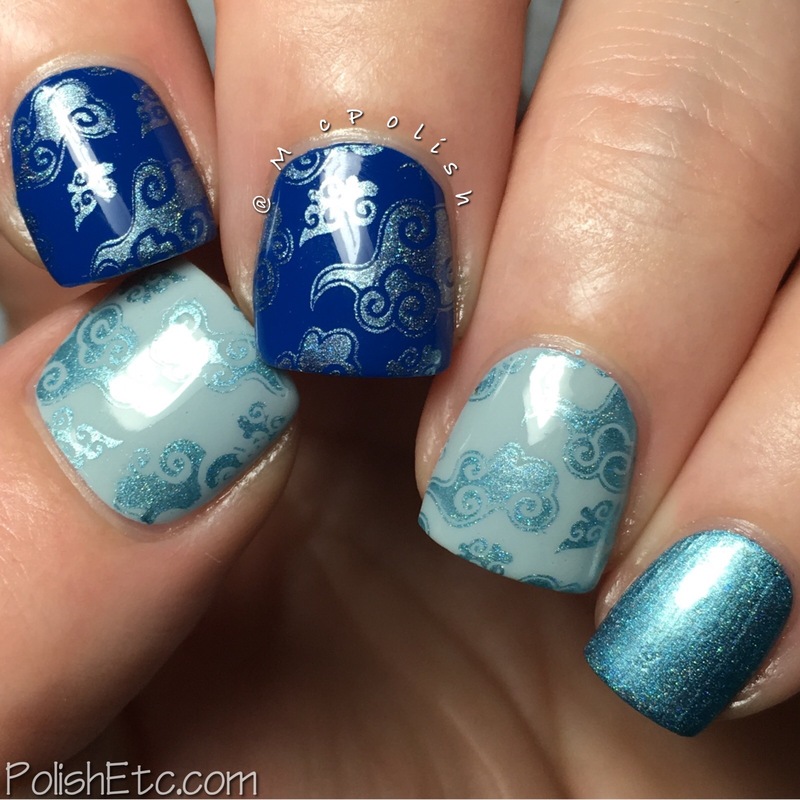 I am showing you Azure stamped over Zoya "Mallory" and "Lake" using the UberChic Far East-02 plate. On my pinkie is two coats of Azure on it's own. 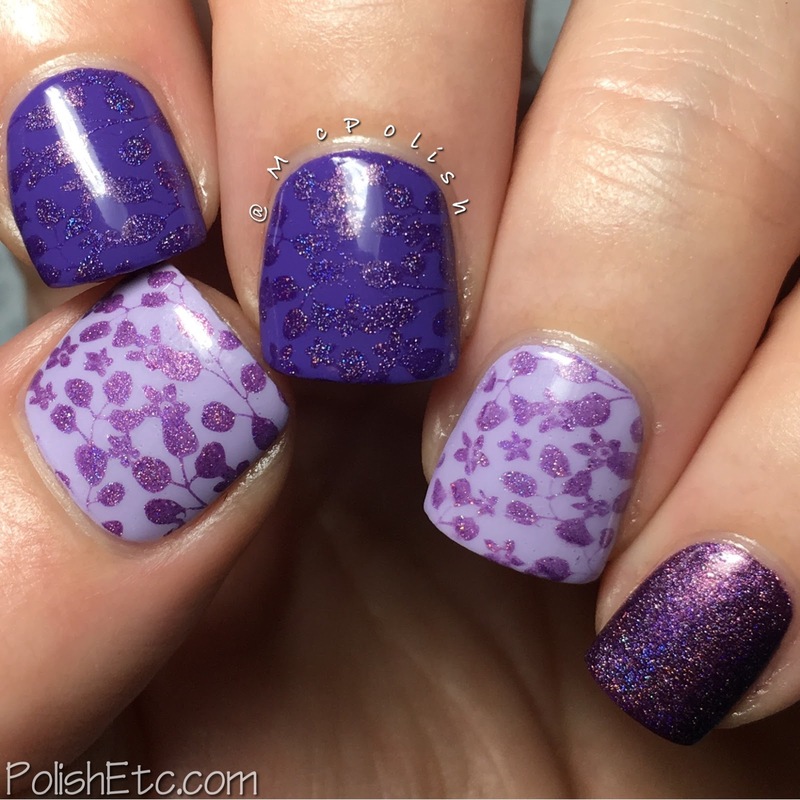 Orchid - A warm deep purple jelly with with holographic effect. This shade has the stongest hologrpahic effect of them all. The base is more a jelly which makes it much less opaque than Azure. It stamps well but I did have a little bit of inconsistency with coverage as you can see comparing the two light based nails. 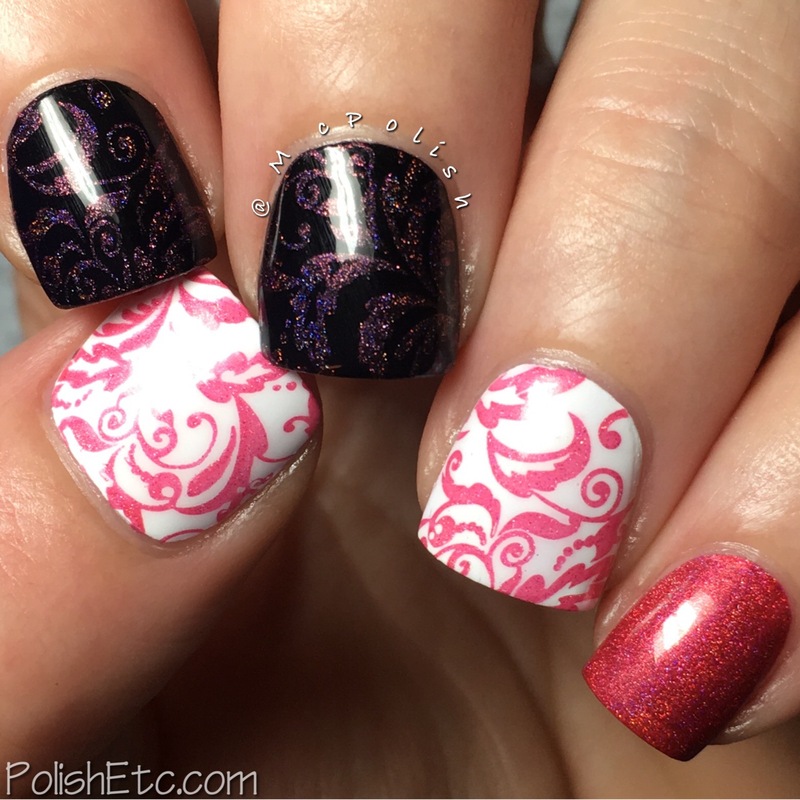 I am showing you Orchid stamped over Zoya "Serenity" and "Marley" using the UberChic Plate 4-03. On my pinkie is two coats of Orchid on it's own. Poppy - A medium toned red jelly with holographic effect. This shade also had a strong holo effect. With the base being more of a jelly finish, it did not give that vibrant red color when stamped. It is more of a pink, especially over white. I find this a problem with a lot of reds that I use for stamping/watermarbling. They have to be super duper opaque in one coat to show up red or else they come off as pink. It stamped beautifully though. The edges were crisp and consistent. I am showing you Poppy stamped over Digital Nails "I See London" and "I See France" using the UberChic Plate 7-01. On my pinkie is two coats of Poppy on it's own. Blush - A blush pink with holographic effect. This shade has a touch of metallic in it but not as much as Azure. It is a very delicate color of pink and the holographic effect is very soft as well. I really enjoyed how this looked over the lighter colors. The stamping was crisp and consistent. 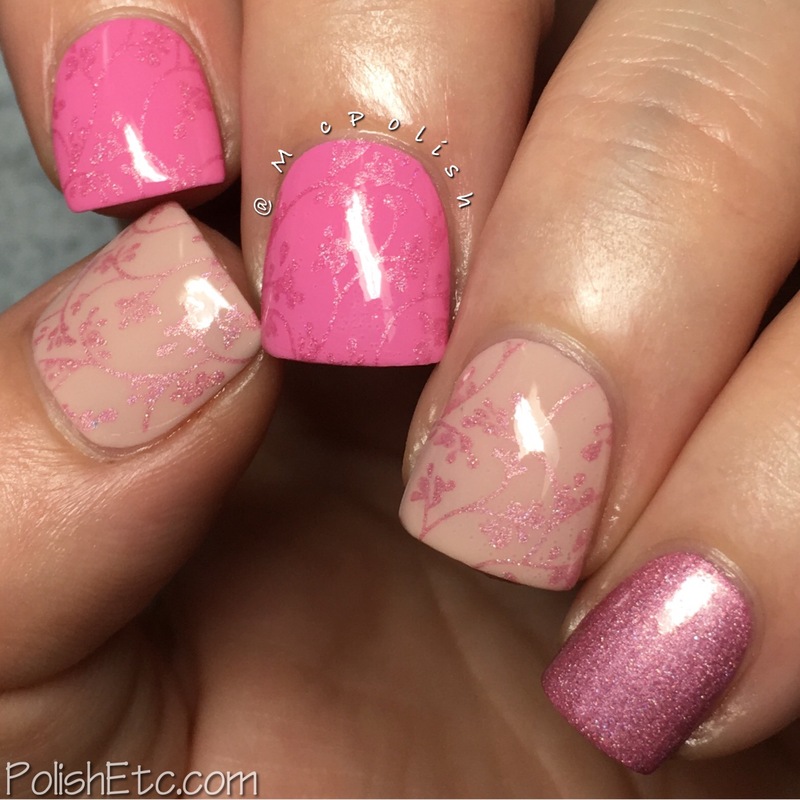 I am showing you Blush stamped over Zoya "Sweet" and "April" using the UberChic Plate 4-02. On my pinkie is two coats of Blush on it's own. 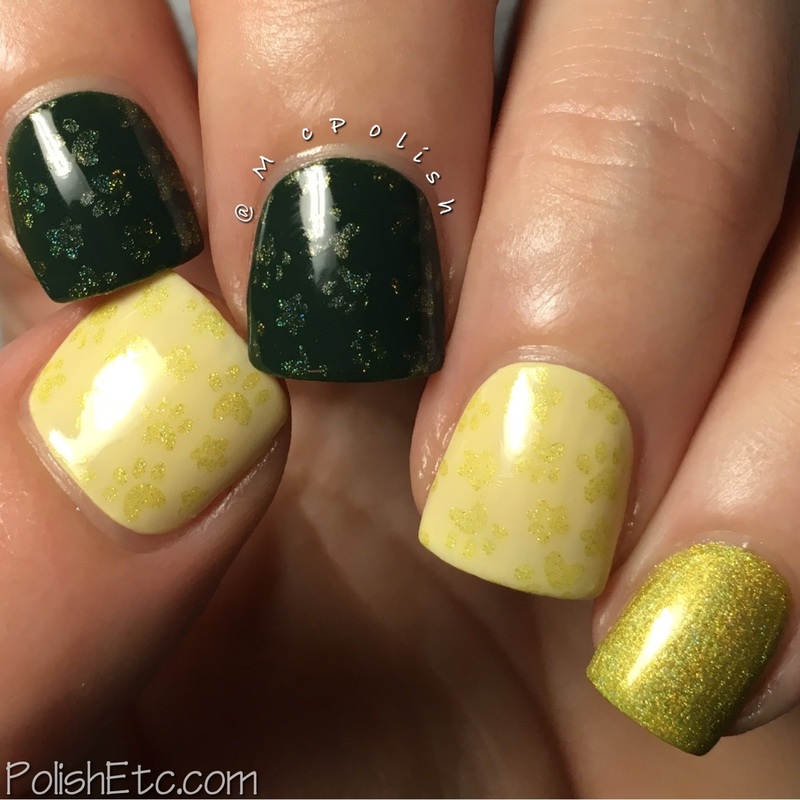 Zinnia - A light yellow-green jelly with holographic effect. This shade is the most subtle of them all. The jelly base was very sheer which made it difficult to see over darker colors. Plus, it was inconsistent with opacity. 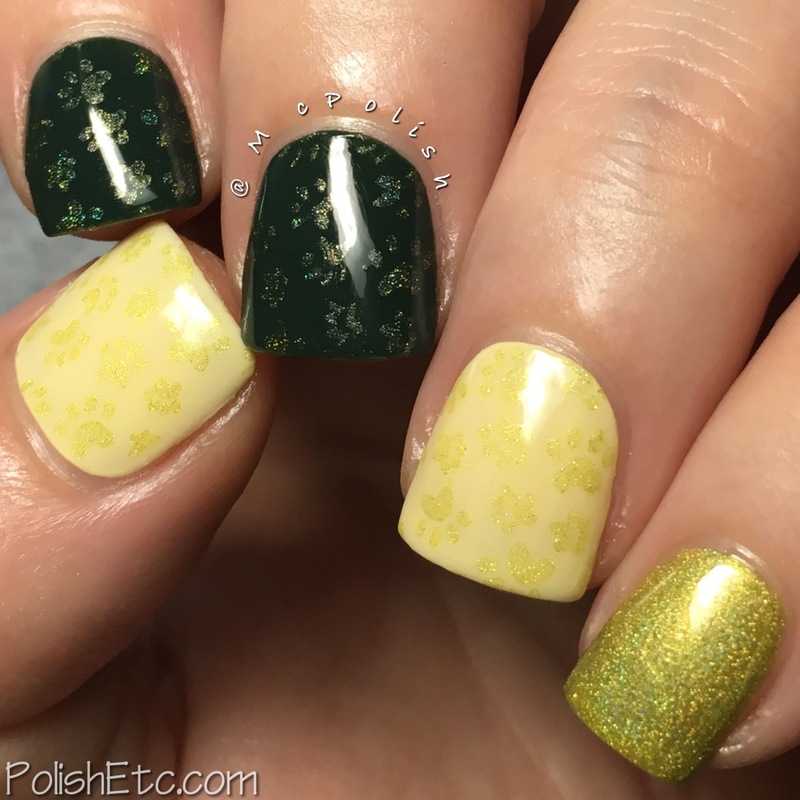 Over the darker shade, you are really just getting a yellow tinted holo effect. Over lighter shades, you can see much more of the yellow base. I am showing you Zinnia stamped over Zoya "Hunter" and Ulta "Cream of the Crop" using UberChic Furry Best Friends. On my pinkie is three coats of Zinnia on it's own. Overall, I liked these new colors (except for Zinnia). I do wish that they were all the same formula and finish that Azure was. She is the clear stand out of the bunch. I have not tried the creme colors from this line but from the reviews I have seen, they look like winners. 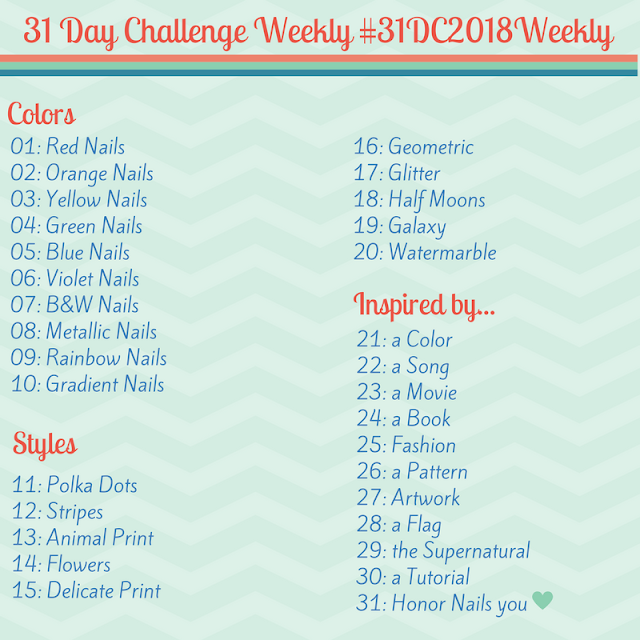 You can get all of the Celestial Cosmetics stamping shades from Color4Nails right now. They provide affordable international shipping world wide and great deals on hundreds of indie and mainstream polishes.